It's all kinds of beautiful in Bora Bora. All photos courtesy of Paula de la Cruz. Wait, is that a unicorn? It might be in Bora Bora, where time stands still and the sounds you hear are waves lapping on coral. BORA BORA — On a warm night, upon landing in Papeete, the capital of Tahiti, I notice that everyone’s feet seemed to be trying to escape the thongs that contain them. Shoes are worn here like an afterthought, an uncomfortable necessity of urban development. Away from the capital, and now on the beach at , I channel as much Gauguin as I can muster. I stare at the palm trees above me and wonder if Polynesian women learned their sway by watching them. I go back to my book, , by Herman Melville, while I sip a Beachcomber. There is no pace here. Minutes feel like hours, like life on an imaginary planet that doesn’t spin. The only sounds come from lagoon waves hitting coral and from the wind. I’m closing my eyes. But wait, is that a unicorn? A couple on a honeymoon has drifted from their water bungalow on plastic floats, he on a chocolate donut and she on a white unicorn. I sit up and notice other floats in the distance: here a pizza, there a golden swan. Overwater bungalows at Four Seasons Bora Bora. When I leave for the spa, I see three young Polynesian women bathing and drinking tea in one of the pools, giggling and taking selfies. One wears a red hibiscus flower on one ear, her waist-long hair and round shoulders oiled with a sweet Tahitian gardenia fragrance. One of the women has come from town as part of a group that will be performing traditional dances during dinner, and invited her mother and sister. That night, I sway to the beat of Polynesian drums (though not like a palm frond) and retire to bed under a full moon glimmering on the black lagoon. The next day, my husband and I rent an ATV and drive around Bora Bora to the top of a rock where we have a 360-degree view of the island. Our guide is a young man covered in tattoos who tells stories of tanes (“men” in Tahitian) braving the rough seas to travel between the islands. It is Sunday, and some families are slow-cooking pork in ground pits covered with lava rocks and banana leaves. The scent of the grill makes us hungry, and we end up at Bloody Mary’s Bar, a local favorite that through the decades has attracted such visiting celebrities as Prince Rainier of Monaco and Leonardo Di Caprio. We make it back to the hotel in time to watch the sunset over the lagoon while we blast questionable music over our water bungalow music system. A lovely dinner of Tahitian poisson cru, a tuna ceviche made with onions, green pepper, cucumbers, diced tomatoes, shredded carrots, and coconut milk, seals the day. There is no pace here. Minutes feel like hours, like life on an imaginary planet that doesn’t spin. For my husband, there is no reason to be on land. He would much rather be diving, SUP'ing, or snorkeling. We go to a nearby deserted motu, an islet in the coral reef surrounding the island, for a barbecue. We snorkel to a nearby bank where we encounter schools of hundreds of butterfly fish, giant sea cucumbers, Picasso trigger fish, and a fierce moray eel. We swim back for a lunch of grilled lobster and fresh mango. We take one last dip in the ocean before embarking on our journey back to the planet where absolutely everything spins. I lie still on the warm sand for as long as I possibly can. With abundant overwater villas straddling the aqua water of Bora Bora's incredible white-sand shores, it's hard to go wrong with accomodation options. I stayed at three different hotels in Bora Bora. 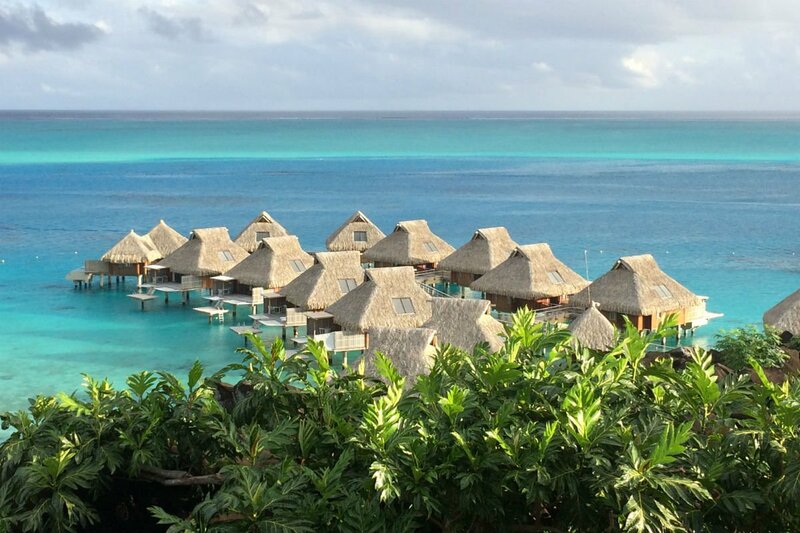 A wake up call at The InterContinental Bora Bora Resort & Thalasso Spa. opened in March 2017 after an incredible multi-million dollar renovation. The thatched-roof villas now feature natural timber-laden interiors, while a king bed looks out across the waterside balcony and azure blue water through gauzy white curtains, only rivaling the view from the decadent circular bath. Especially memorable is the canoe breakfast, a smorgasbord of fresh croissants, omelets, and fruit brought to each over-water villa by handsome Polynesians on a classic outrigger canoe called a va’a. Like an offering from the gods. Paradise at your front door at Four Seasons Bora Bora. 's secluded three-bedroom, beachfront villas combine indoor and outdoor living with a private infinity pool, expansive hammock-covered deck, and indoor-outdoor bathroom with a private, sun-dappled, freestanding tub, all on your own beachside oasis. With teak-filled interiors, the airy, spacious villas are perfect for families or groups. The spa is built as if it had been carved inside a trunk of a giant gardenia. Most luxurious spa scrub: Kahaia Haven treatment with black pearl powder. Relax with the fish at Conrad Bora Bora Nui. With its own dive shop, is great for divers, but for those unwilling to get under the water, a lagoonscape sees schools of fish swimming below your feet in the living room. The villas here have it all: high ceilings, Polynesian-inspired textiles and decor, bathtubs with ocean views, and enough surrounding lush greenery to make it feel like a jungle treehouse. Plus, it's more affordable than Conrad and Four Seasons. The ocean water thalassotherapy pools do wonders for toning legs and arms. It would be a shame to leave without black pearls, which are available at many shops in town as well as in Papeete. Just don't try to find them underwater. While talking to the managers at all three hotels, I was surprised to learn that many guests abandon their pool floats before flying back home, and that the hotels end up having to store them or dispose of them. More plastic is the last thing any island needs. Please consider the environment if you decide you simply must travel with your pool float.